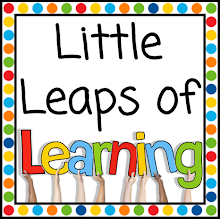 Little Leaps of Learning: Thinking is the key! Phew! Holidays are 4 days in (I only count the weekdays). I have a feeling it will be a restful but productive break, judging by the fact I've almost finished my Christmas shopping AND I've managed to upload my first ever product to TpT! 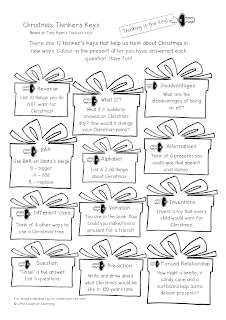 It's a Christmas themed creative thinking activity based on Tony Ryan's Thinkers Keys. Please please please go to my store and press that little "Follow Me" button... and download this freebie of course! We had a full week of morning swimming lessons on the second last week of school. So, as you can imagine, the kiddies were zonked once they got back to school each day! But... they loved working through the Thinkers Keys activity I made. To start with we did a few keys together but by the Tuesday they were enjoying choosing their own key to work on for that day. It's all about independent working in year 2!!! It would be beneficial if you've already introduced the idea of Thinkers Key prior to this, but this activity also stands alone. Congrats on uploading your first product, I'm your first follower!